This is breathtaking — literally! I hear myself gasp as the vista of snow-covered mountaintops, white-laden crags and ghostly evergreens unravels below. A large hand has surely reached down and sculpted rugged peaks, gentle hollows, undulating slopes and sheer drops. We are now seemingly compressed between two stark sides of rock, following the gentle flow of the Bow River. The forests are thick, the plains green and the houses minuscule. Is this the highest point of my trip to Alberta, Canada? I wonder. Can it possibly get any better? My first dose of the Rocky Mountains has been agreeably awesome! The helicopter ride with the Rockies Heli Tours team has been a mere stopover at Stoney Nakoda Resort and Casino, on the road from the city of Calgary to Banff in the mountains. To warm goodbyes, we leave the strip, not much more than a field behind the resort, and continue on our way, in our private coach, to Banff National Park, a unique preserved and protected World Heritage site that virtually offers visitors the same sights that greeted explorers who came to the Rockies over 100 years ago. Established in 1885 as Canada’s first national park, it offers high alpine meadows, jade green lakes, unusual gorges, canyons and rock formations and a tranquillity that is arguably unmatched. We get a dose of this already, as we stop en route at Vermillion Lakes and Bow Falls for photo ops. 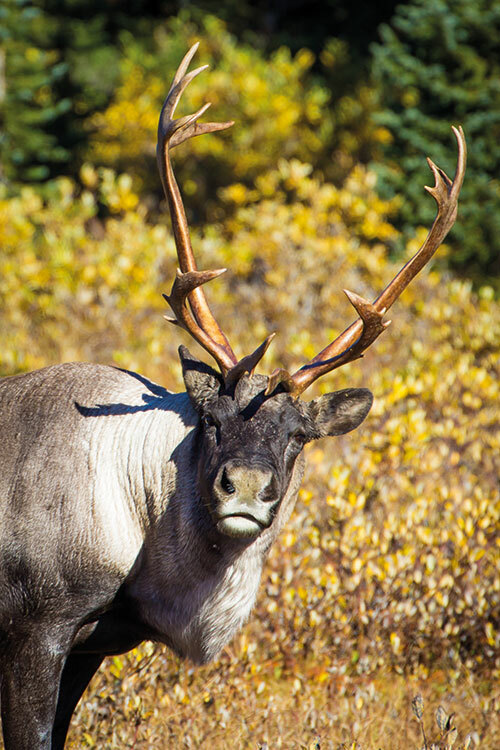 You may come here for heart-wrenching vistas as also for the wildlife, hoping to catch a glimpse of big horn sheep, elk, moose and mountain goat. And then there’s the hiking, climbing, horseback riding and canoeing; and in the winter, snowshoeing, ice skating, skiing, snowboarding and dog sledding. 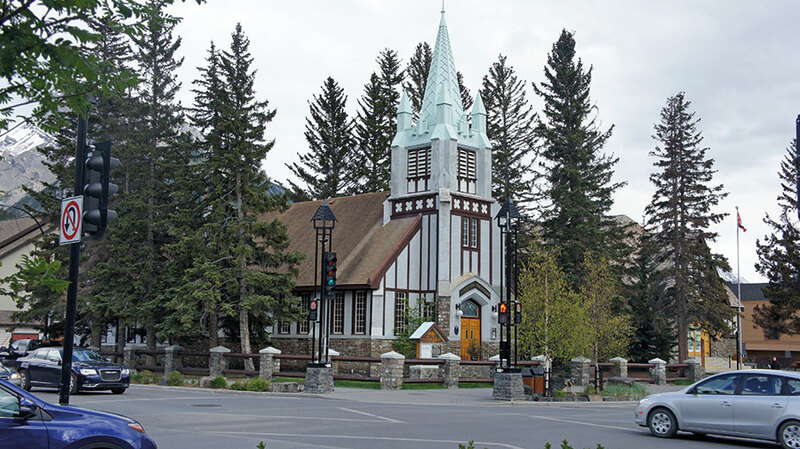 Or, there is plain ole sightseeing — a much less vigorous pastime that I am in love with, I realise, as I wander the main street in Banff, Canada’s highest town at an elevation of 4,537 feet. 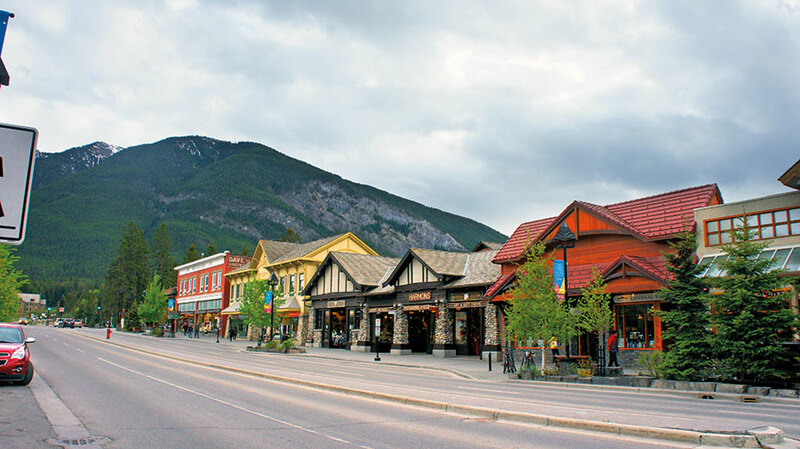 I take in the chocolate and candy stores, ice cream parlours, sportswear shops, jewellery boutiques, curio and souvenir outlets and restaurants that line the main street even as the iconic sight of Mount Rundle, named after missionary Robert Rundle who passed through in the 1840s, looms over the townscape. The air is crisp and cold and the mountain ranges seem to dwarf everything around. We drive down Mountain Avenue that winds through dense forest for four kilometres, to the Sulphur Mountain Gondola. Our four-passenger cabin transports us in a mere eight minutes to the summit at an elevation of 7,486 feet above sea level. The 360-degree view from the upper gondola terminal is sensational with mountain ranges and the entire Banff townsite and valley spread out below. You may stretch your legs along the view-decks or on the Summit Ridge interpretive boardwalk. For us, however, it is time for a relaxing and warming soak. 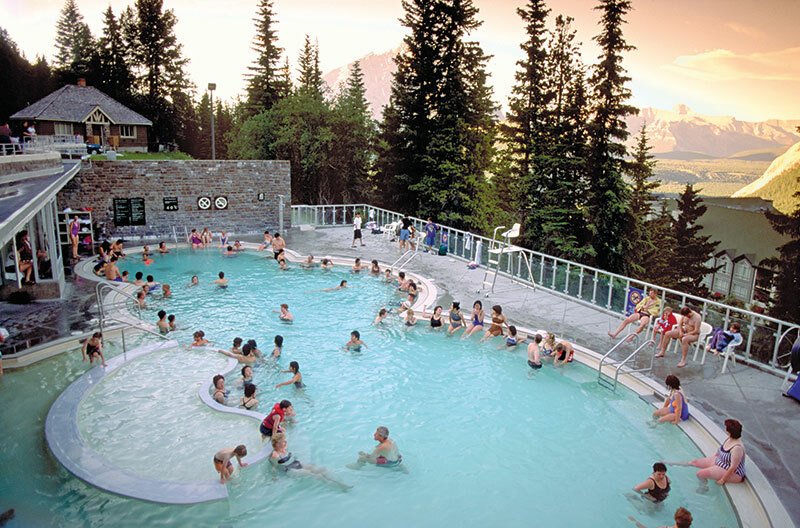 A very short drive away is located the Banff Upper Hot Springs, inviting you to soak in hot mineral waters from all-natural sources. Climb into the open-air pool that steams into the cold air and sink into the encompassing and comforting warmth that has drawn visitors for more than a century, while enjoying the spectacular alpine scenery. If you have failed to bring bathing togs along, rent or buy cool retro costumes. Relaxed and comforted, this is perhaps the best time to visit the area’s iconic hotel, styled after a Scottish baronial castle. The Fairmont Banff Springs is known for its hospitality, scenery, and spa and, in case it interests you, a popular afternoon high tea! After, drive down to Lake Minnewanka, the largest in the park and the only one on which powerboats are permitted, to discover the history and beauty of the ‘lake of the Water Spirit’. 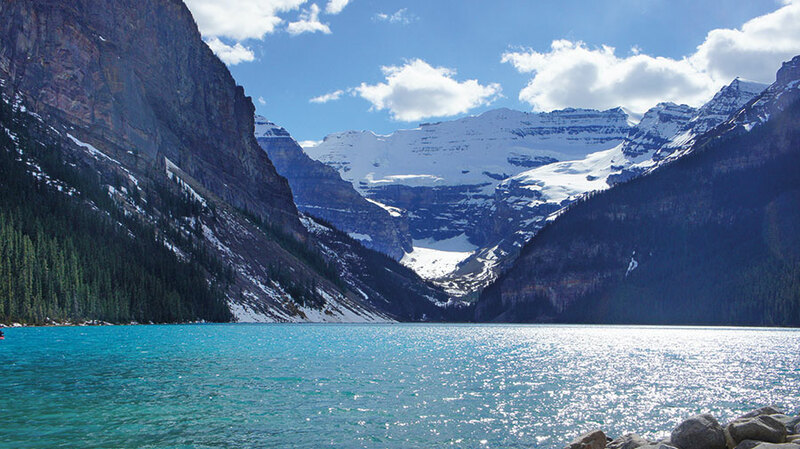 Leaving the town of Banff, we head out to Lake Louise, the most famous glacial lake in the Canadian Rockies, named after Princess Louise Caroline Alberta, daughter of Queen Victoria. The earlier spellbinding aerial view of the mountains is rivalled by the lake vista that greets me. Lying 5,680 feet above sea level, it is cradled by mountain peaks while the Victoria Glacier, named for the queen, looks frozen in mid-pour. Melting glacier silt imparts the striking turquoise colour to the water and keeps it a frigid temperature year round. On the opposite side from the glacier is located the Fairmount Chateau Lake Louise with its stores and cafes on the ground level where I warm up with a cup of hot maple tea. As we clamber back onto our bus, I have a question for driver/guide Bob. Does living with the spectacle of the Rockies make him take them for granted? “I have been in the area for 35 years,” he says. “But, on certain days, I stop to look at the mountains and they continue to stun me and they bring a smile to my face. Like today! I can never quite get used to the sight of Lake Louise….” I try to imprint this frame of lake, mountains and glacier forever in my mind’s eye, like with a favourite painting that one wants to recall later, in quiet solitude. 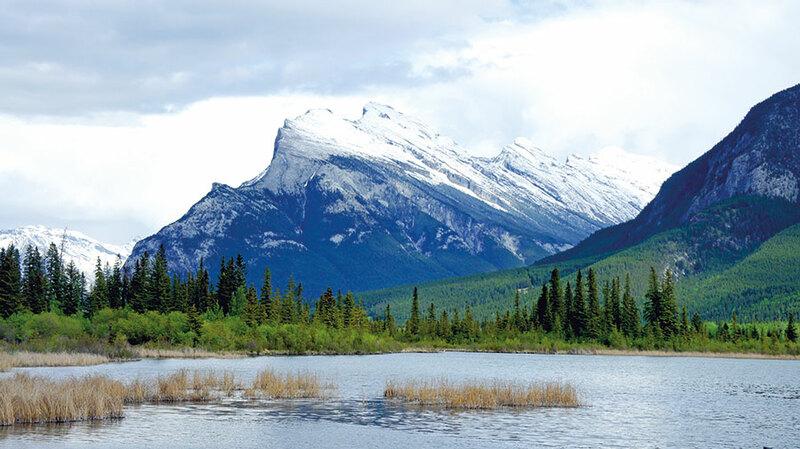 We now embark on a three-and-a-half-hour drive along the 230-kilometre Icefields Parkway that weaves around the mountains between Banff National Park and Jasper National Park to which we are headed. Named for its tremendous glaciers that flank its westward side (tip: ensure a seat on the left side of your vehicle for uninterrupted views), this has to be one of the world’s most scenic drives. Let me put it this way: that sculptor in the sky? His scalpel is definitely in overdrive, out here! Starting from Lake Louise, Victoria Glacier dominates the view until we reach Herbert Lake. We drive past mountain ranges haloed by snow, half-frozen lakes shimmering in the sunlight, waterfalls that descend in graceful curves, alpine fields and stands of conifers. From Bow Lake, the source of Bow River, the Parkway climbs to Bow Summit which Bob announces as the highest point of the journey, at an elevation of 6,785 feet. The road now descends into the Mistaya Valley continuing to the Columbia Icefield, after entering Jasper National Park, the largest in the Canadian Rockies, an 11,000 square kilometres of untamed wilderness, a Designated Dark Sky Preserve (kept free of artificial light pollution in order to promote astronomy) and part of a UNESCO World Heritage site. As we approach the stone building of the Icefield Centre for a quick lunch before embarking on further adventure, it begins to snow. Soft and gentle flakes rest fleetingly on our shoulders. Unseasonal drifts! Sent just to make our upcoming experience on the Columbia Icefield ever more exciting. Composed of eight glaciers and encompassing an area of 325 square kilometres, the ice mass here is the largest south of the Arctic Circle. We clamber onto the massive Brewster IceExplorer Snocoach that has tyres as tall as I am, and takes us to the ‘toe’ of the Athabasca Glacier. We step out onto the ancient ice, a stark canvas painted white as far as the eye can see, even as the snow comes down harder. It is remarkably warm as we take selfies and photographs and drink the pure waters of the melting glacier. We strike poses in the falling snow, excited by the very fact of being here. 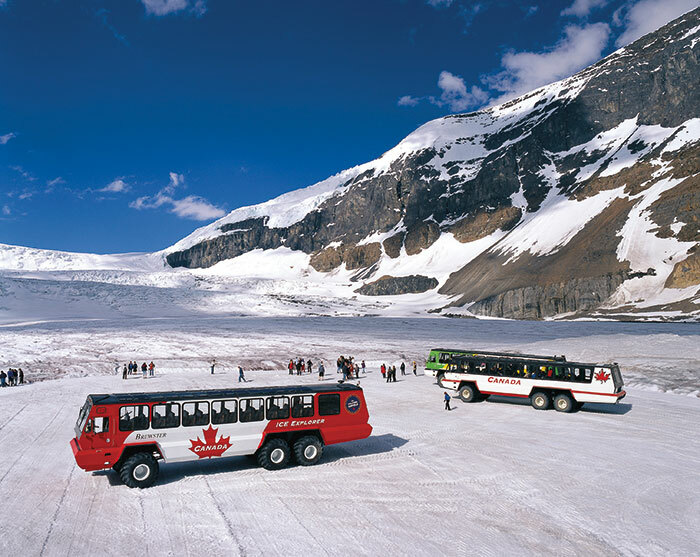 Regrettably too soon, we head off in our bus to the second attraction at the Columbia Icefield — the experience of walking out on the Glacier Skywalk, 918 feet above the Sunwapta Valley. The snow turns into rain and an icy wind tugs at our coats as we traverse the cliff-hanging, glass-floored observation walkway, confronting layers of geological history exposed below while a couple of mountain goats stare at us, unperturbed. Following a short stop at the Sunwapta and Athabasca falls en route, we arrive at Jasper, a picturesque mountain ‘village’ and the starting point of adventure at the national park. The one main street is lined with boutiques, sports stores, fudge shops and restaurants. Breakfast at a local, family-owned establishment, Papa George’s Restaurant, has us downing platters of eggs Benedict, sausages and steak as well as skillets of pancakes. Washed down by coffee or the newly discovered maple tea. With satisfied bellies, we head out to the Jasper SkyTram, the longest and highest guided aerial tramway in Canada. The seven-minute ‘flight’ takes us to an altitude of 7,472 feet for views of six mountain ranges, glacially fed lakes, rivers and the town itself. The inclement weather has caught up with us as the whiteness of the snow augments white clouds that roll in as we get into snowshoes in an attempt to reach the summit. Of course, we do not succeed! However, a lunch at their restaurant, of wild bison burger and elk meatloaf, has us feeling on top of the world again. Now for some adventure of the gentle kind! 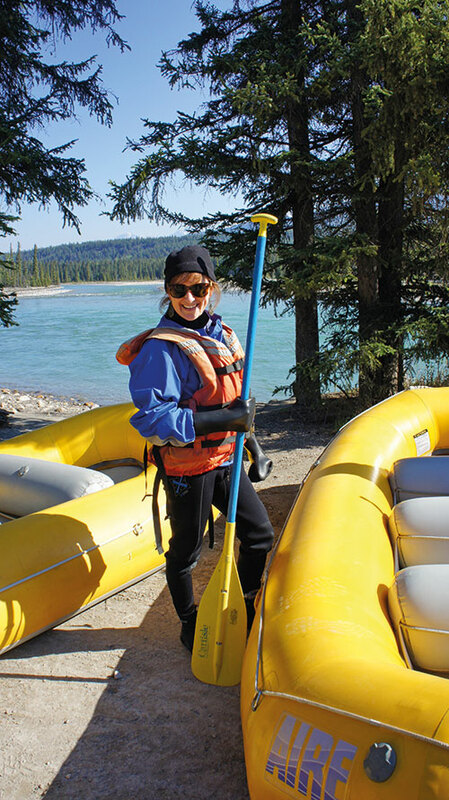 Togged up in safety jackets, and after a short safety drill, we have an easy rafting experience down the Athabasca River, a designated Canadian Heritage River, following the route used by fur traders over two centuries ago. Our guide does all the rowing while we duck an errant splash or two. 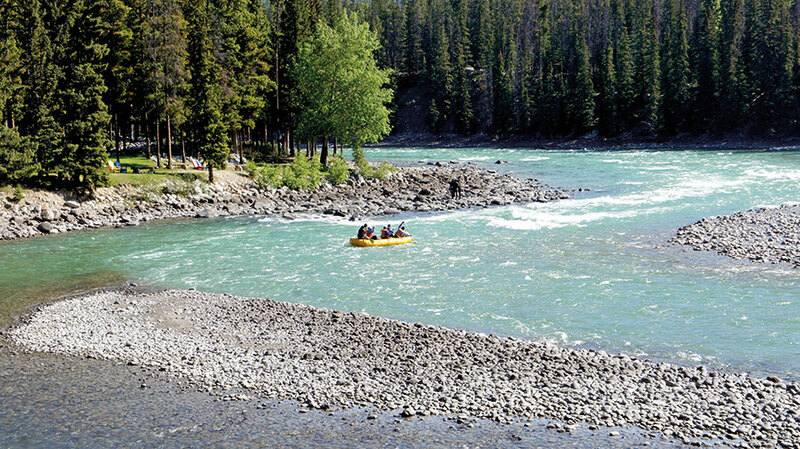 The river is lined with coniferous trees, we spot the ubiquitous Canada goose and the rapids are gentle enough that we are lulled into a sweet space. But soon enough we find ourselves driving out again, this time to the nearby Maligne Valley, where we stop at Maligne Canyon and at the ‘disappearing’ Medicine Lake, for further scenic stimulation. The weather continues to play spoiler as we visit one of the highlights in the area — the Jasper Planetarium. In the 35-seat inflatable domed theatre we tour the world’s largest accessible dark sky preserve with Peter McMahon, who is rightly regarded as a bit of a celebrity here. And, on a clear night, one may get to gaze through the largest telescope in the Rocky Mountains. Not tonight though. We have to be content with stories of Jasper’s amazing skies, of the Northern Lights that emblazon the horizon regularly (an app, Aurora Watch, provides notifications) and of the promise of expanses of beauty that refuse to be contained only on the earth. 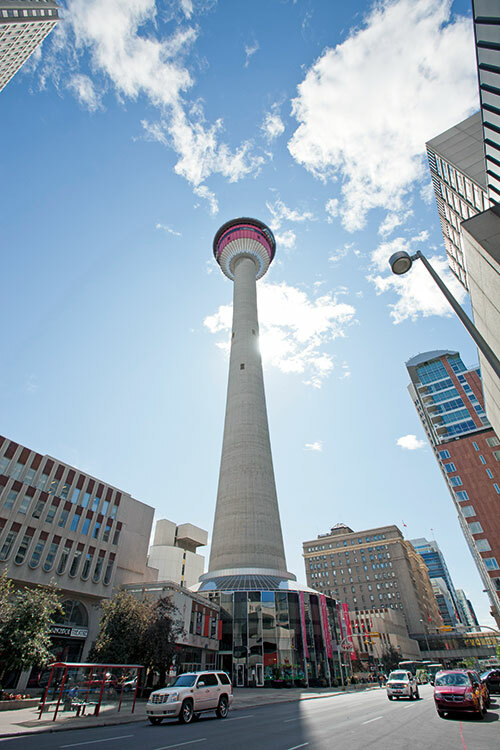 Visit: Heritage Park Historical Village with its 180 buildings and exhibits showcasing how the West once was; the observation deck of Calgary Tower for 360-degree views; Peace Bridge for the White Hat Ceremony, a long-standing tradition. Shop: Alberta Boot Company for Western-style boots worn by royalty and movie stars. Eat: Ten Foot Henry for family-style, vegetable-focused New North American cuisine. Stay: Chateau Lacombe with panoramic views of the North Saskatchewan River Valley. Visit: Elk Island National Park, home to free roaming plains bison, moose, deer and over 250 species of birds; Ukrainian Cultural Village, an open-air museum depicting early settlement in east-central Alberta and offering an authentic Ukrainian lunch. Take: Guided Segway or bike tours with River Valley Adventure Company. 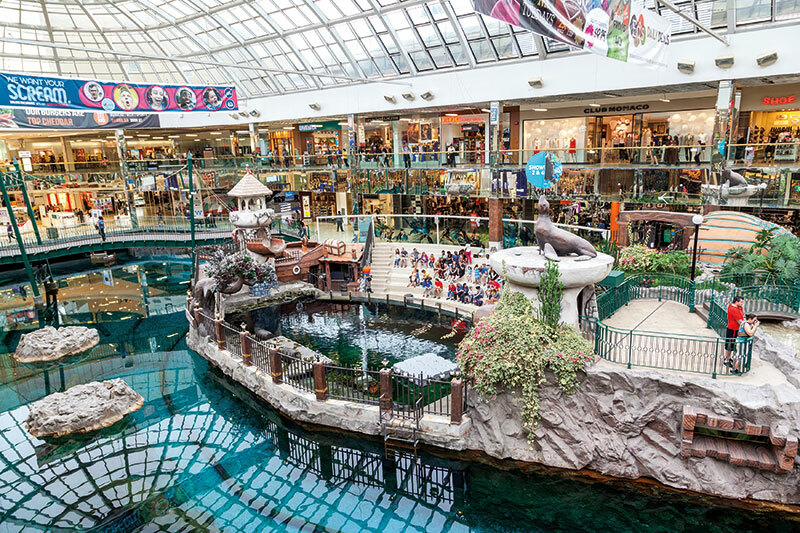 Shop: West Edmonton Mall, for an intense retail experience as well as entertainment at the World Waterpark, casino, movie theatres, mini golf courses, roller coasters and restaurants. Eat: Guru, for a different kind of Indian food.